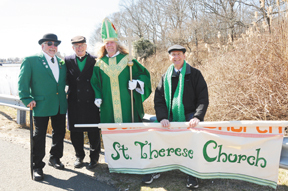 The luck of the Irish was betowed on Montauk for the weekend of all the St. Patrick’s Day activities. Unlike many weekends in the past, when they had snow and rain storms, even into the end of March, this time the weather was in the 40’s with lots of sunshine! 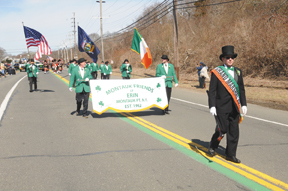 Crowds of thousands lined the barracaded streets of downtown Montauk, as the two-hour parade on Sunday, March 24, wound its way from the Montauk Fire Department, down Edgemere Road, and finally down Main Street all the way to the IGA store. The grandstand was set up on the Village Green, with bleachers filled with onlookers and local dignataries who judged about 70 contingents that entered the parade. As in years past, the emcee of the parade was Rick White, Jr., wearing his Irish sweater and cap, and entertaining the crowd. 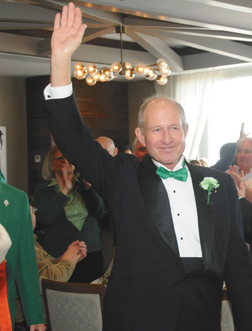 It was a dramatic sight as The Montauk Friends of Erin led the parade in their green blazers, with this year’s 57th Grand Marshal, local attorney Gordon Ryan, waving to the crowds. Wearing a top hat, and carrying the traditional sheleighleigh, Ryan looked every bit like the perfect Grand Marshal. Also in the parade were the bagpipe and school marching bands, firetrucks from all East End departments, numerous floats and organizations, and many boats and classic cars. 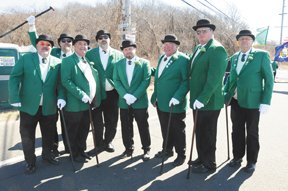 The Montauk St. Pat’s Parade, which is said to be the second biggest in NYS, is also unique in that there are so many people entering their boats. Winning entries in the Float Division went to: First Place—Candied Anchor, Second—Nancy Atlas, Third—Creative Edge Dance Studio, Fourth—East Hampton Kiwanis Club, created by Henry Uihlein and his crew. As usual, the WLNG rolling roadcaster bus covered the parade while parked outside the Montauk Chamber of Commerce, as their members were busy holding their famous clam chowder sale on the street across from the judge’s stand. Each year, the Chamber sells the chowder, donated by local restaurants, as a fundraiser for the parade. This year for the first time, they had a boat imprinted on the mugs. 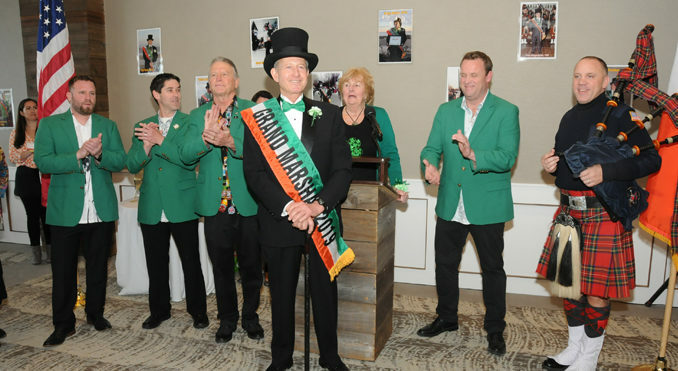 Prior to the St. Patrick’s Parade on Sunday, the big Irish weekend started on Friday, March 23, with the traditional Grand Marshal’s Luncheon, held this year at Gurney’s Montauk. 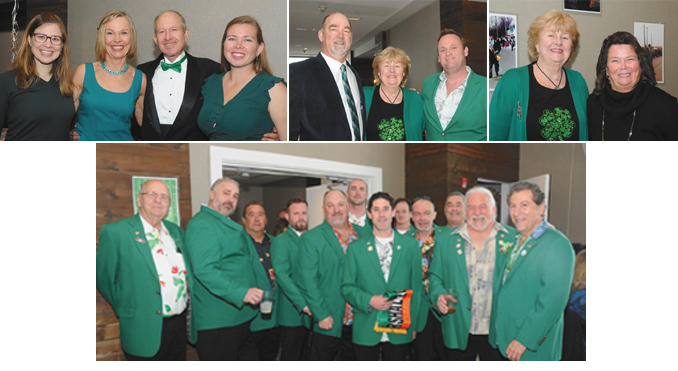 The sold-out crowd of about 200 people sat at tables downstairs, decorated with shamrock-like plants and green beads. This luncheon happens each year to both honor and roast the Grand Marshal. 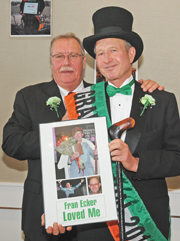 Gordon Ryan and his wife Dianne were good sports, as each prior Grand Marshal, including Herb Herbert, Joan Lycke, (who also organized the luncheon), Jack Perna, Henry Uihlein, George Watson, Paul Monte, Kathy Keller and Eddie Ecker, stood up and joked with them. Gordon Ryan’s two daughters, Robin and Loralee, also talked about him, and Betsy Bambrick, of East Hampton Animal Control, sang a song. East Hampton Town Supervisor Peter Van Scoyac gave him a proclamation, lauding his volunteer work to establish a Youth Court and assist the EH Police. Ryan also volunteered at the Breakwater Yacht Club races and as a consultant for “The Affair” TV show series, which was filmed in Amagansett. He was also named “Mr. 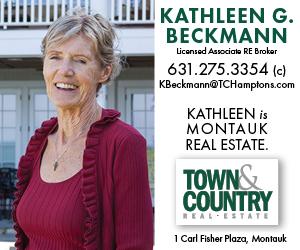 Amagansett” at the Stephen Talkhouse contest. 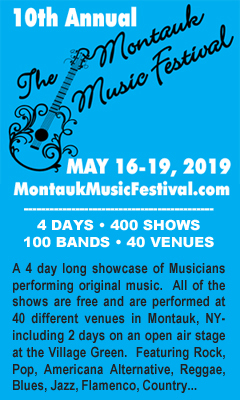 Finally, Gordon Ryan’s wife, Dianne, talked about all the fun they had creating over 35 floats for the Montauk Parade, under the name of Ryan’s former marine towing business, “Promised Land Salvage Company”…with different humorous, irreverent, political and socially conscious themes….such as “Michael Jackson Daycare,” “Trump–Putin America First,” “Lorena Bobitt Sausage Company,” and “Elliot’s Angels,” about Elliot Spitzer. Another fundraiser, The Friends of Erin Cocktail Party,” was held Saturday night at Gurney’s Montauk…with music by “Remember September,” an open bar and a great buffet. 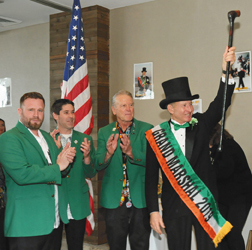 There was another celebration of Gordon Ryan with the famous Amityville Pipe Band, which also played with the Montauk Friends of Erin when they marched in the NYC Parade down Fifth Avenue on March 17. This cocktail party is always well attended, as a chance for locals and tourists to kick off the “unofficial start of summer,” as they call it. And with the gorgeous spring weather, it wasn’t far from the truth.